My god, it's 92 degrees outside. And I loooove it. Warm weather puts my body completely at ease. Sadly, it means I was only able to wear my new spring trench coat twice before it was rendered completely unnecessary due to the rising temperatures. Anyway.. This week flew by, didn't it? I've been studying for exams (as usual) and counting down the days 'til summer break (ahem, forty-one..). 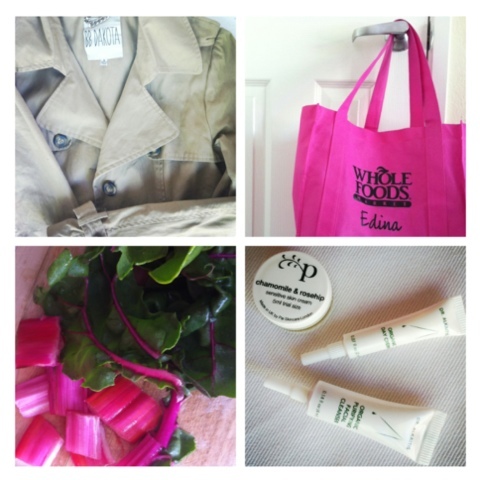 Also on the agenda: toting around a snooty pink grocery bag, sampling samples (Dr. Alkaitis I love you! ), and chopping up some gorgeous Swiss chard. Cheers, have a great weekend everybody! Please send some heat this way, it's still in the 60oCs here brrrr. Have a great weekend!